This easy to set up Halloween kids' party game can have the rules tailored for different age groups. This is a guide about spider web game. 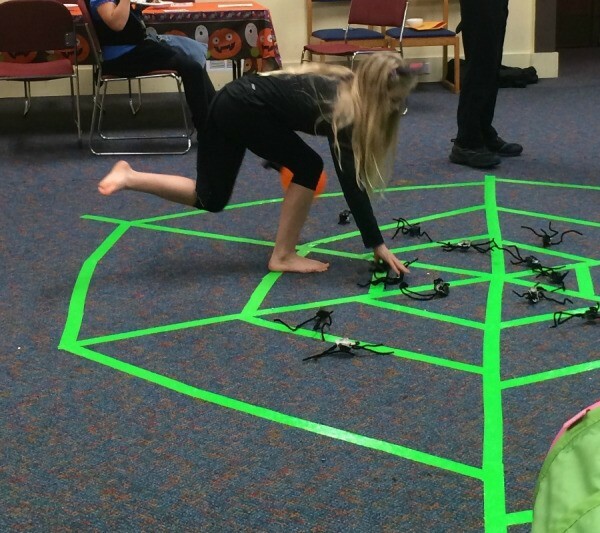 Our kids went to a Halloween party last week and this is one of the games they played. There was a spider web on the floor, made with tape. The spiders were made out of egg carton cups, with chenille stick legs, and googley eyes. The spiders were spread out around the web. The goal of the game was to pick up all of the spiders, while hopping on one leg, inside of the web opening (hop scotch style). For the older kids they made it harder by having them hold a ball in one hand, so that they only had one hand available to collect spiders. It was a quick and easy party game, that all of the kids seemed to enjoy! using this in my grade 1 ESL class ...thanks! Where do you put the spiders once you pick them up?